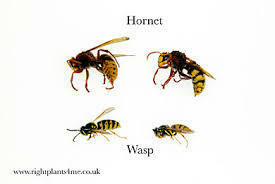 Wasps make up an enormously diverse array of insects, with some 30,000 identified species. We are most familiar with those that are wrapped in bright warning colors—ones that buzz angrily about in groups and threaten us with painful stings. Wasp nests that are visible and near human activity can pose a potential problem. 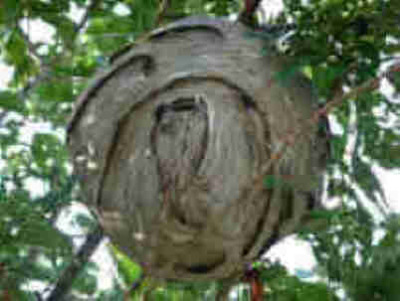 If there is a concern about stings, you should eradicate the nest or call a professional for help. The most challenging nests to control are those that are concealed in voids behind walls or in attics. Often, the only evidence of the nest is wasps flying back and forth through a crack or hole in the home. Wasp Stings In most people, a yellowjacket sting produces an immediate pain at the site of the sting. There will be localized reddening, swelling, and itching. Ice or analgesic creams often relieve the symptoms. Some people experience an allergic reaction to yellowjacket venom. Allergic (anaphylactic) shock can be fatal if untreated. Symptoms usually occur 10-20 minutes after a sting but may appear up to 20 hours later. If you experience any of the following symptoms after being stung, obtain medical aid immediately. The danger of bee stings: The two greatest risks from most insect stings are allergic reaction (which occasionally, in some individuals could be fatal) and infection (more common and less serious). Bees leave behind a stinger attached to a venom sac. Do not try to pull it out as this may release more venom; instead gently scrape it out with a blunt-edged object, such as a credit card or dull knife. Wash the area carefully with soap and water. This should be continued several times a day until the skin is healed. Apply a cold or ice pack, wrapped in cloth for a few minutes. dabbing on a tiny amount of household ammonia. Over-the-counter products which contain ammonia are also available for insect stings. taking an over-the-counter antihistamine, if approved by your physician. Be sure to follow dosage instructions for children.